So, it’s over. After a year on the road I am coming home. Unfortunately, it wasn’t my decision. 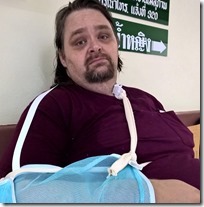 While visiting friends in Thailand, I fell through a footbridge and broke my shoulder. With surgery and physical therapy coming we decided it will be easier in Atlanta than in Bangkok. For me the real shame is that we have to cancel the Hello America Road Trip. I was really looking forward to crossing the country and meeting some great developers. Don’t worry we’ll reschedule it. The last year has been an amazing experience. We had always planned on the trip lasting a year. Ironically, the accident happened one year and one day into the trip. Perhaps it was the universe telling me to get back home. Many people have reached out to make sure that I’m doing OK. Let me reassure you things could have been much worse and I’m very grateful for all the outpouring of support. The good news is we’re headed back to Atlanta and you’ll get to see my ugly mug at your local conference, user group, or code camp soon. I’m very excited about the new ASP.NET web stack and Microsoft’s new strategy of open sourcing and everything. I am sure that soon you’ll be sick of hearing me talk about it all. Thanks for your support and I suspect I will see you soon!